True participatory design and planning may be the norm for us at m:g, but it is not necessarily common practice around the UK. Nevertheless, the system has come a long way over the last century, and these days, a Statement of Community Involvement is at least a key part of any planning application. Whether that involvement is meaningful or not is another story! 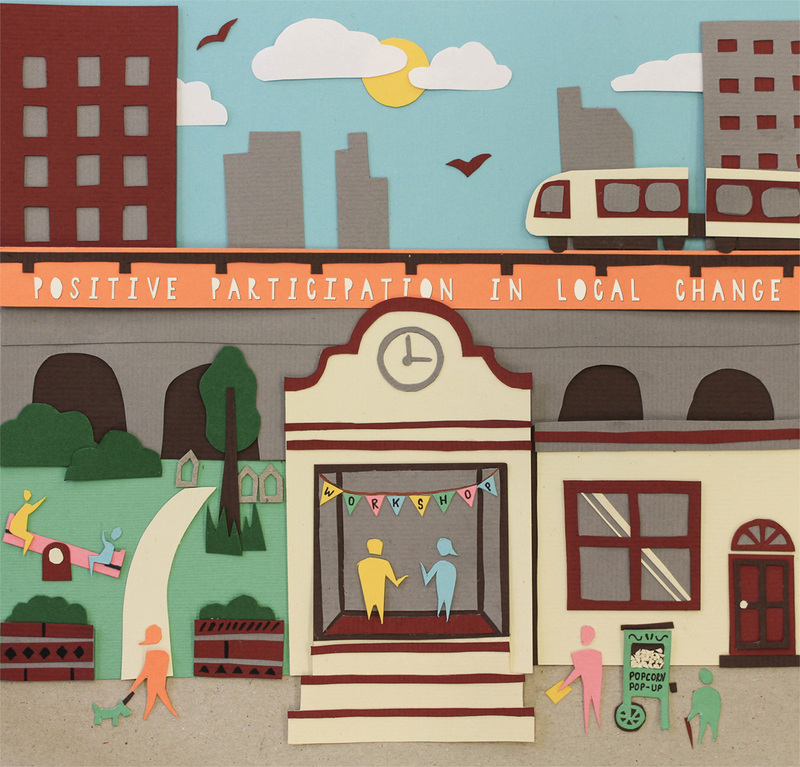 But as the culture hopefully shifts to more comprehensive, inclusive participation in change, we look back on the history of co-designing places in the UK over the last 100 years. In the early 20th century, at a time when urban planning had more to do with the top-down “utopian” visions of Ebenezer Howard than the feedback of citizens, the pioneering town planner Patrick Geddes in his 1915 book “Cities in evolution” broke with tradition by advocating planning that considers the needs and ideas of local people – but it would be a long time until these proposals trickled down into the planning system. In the 1930s, the field of public opinion formalised as an academic and professional discipline: public opinion polls became more common as companies and governments began to understand the value of listening to people. This was built upon in a remarkable way in the early 1940s, when planners in London began to think about post-war reconstruction following the impact of bomb-wrought destruction. At this unique point of reshaping the urban landscape, government planners decided to use the need for reconstruction as a way to engage the public and grow the role and appreciation of town planning as a tool for recovery and improving lives. Social mapping, public exhibitions, social surveys and public opinion polls were used to better understand the needs and desires of the people they planned for, specifically the task of designing better housing for the working classes, and the public were consulted about planning ideas and policies. The importance of the social survey was emphasised by Patrick Abercrombie, Britain’s most influential planner at the time. In 1943-4 the Stepney Reconstruction Group in London surveyed neighbours about their housing and infrastructure needs, noting that “the more the views of the people are expressed, the more likelihood of their getting the kind of neighbourhood they want.” This is an idea that drives much of the public engagement we see in Britain today. But while the 1940s seemed to be a period of progress in empowering people to engage in the planning process, civic influence remained restricted by legal and professional structures that prioritised technical experts. What’s more, after years of multiple social surveys, consultation fatigue set in among the British public, especially as people did not clearly see their feedback actioned. And so participatory techniques faded into disuse. But by the 1960s, the general public had grown critical of modernist planners’ lack of attention to democratic principles and the unilateral planning decisions made by government. Amid rent strikes and slum clearance protests across the UK, the call for public participation in planning was renewed. Meanwhile, the US and France also spoke out against the undemocratic approach of planners. In France, insincere planning consultation practices were criticised: one poster read “I participate, you participate … they profit.” This increasing awareness of the difference between lip-service consultation and meaningful engagement was articulated by political writer and US Housing department employee Sherry Arnstein with her “ladder of participation” from 1969. Back in Britain, the government responded to mounting anger by organising the Skeffington Committee to restructure their planning process to accommodate public consultation and engagement. The consequent Planning Act of 1969 attempted to increase consultation requirements of local planning agencies. In 1971, RTPI President Jim Amos called for the profession to provide planning aid. “It would do much to make the planning process more democratic and more sensitive to its effects if a free planning advice service could be made available to those in need,” he said. Two years later, Planning Aid services began, facilitated by the TCPA, with partial funding from the government. This involved – and still does to this day – free, independent, professional planning advice to communities to equip them with the knowledge and skills necessary to engage in the planning process. Fast forward to the turn of the millennium and 2004, when the Planning and Compulsory Purchase Act established the requirement for Statements of Community Involvement to be produced by local authorities, explaining to the public how they will be involved in the preparation of local development documents. SCIs are meant to ensure that consultation with the public begins at the earliest stages of development so that communities are given the fullest opportunity to participate in plan making. But, as we’ve seen, these SCIs can end up being one-pagers which describe a grand total of two afternoon-long exhibitions informing the public of plans but not meaningfully engaging them. What’s more, the 2008 Planning Act set out that SCIs do not have to undergo independent examination. 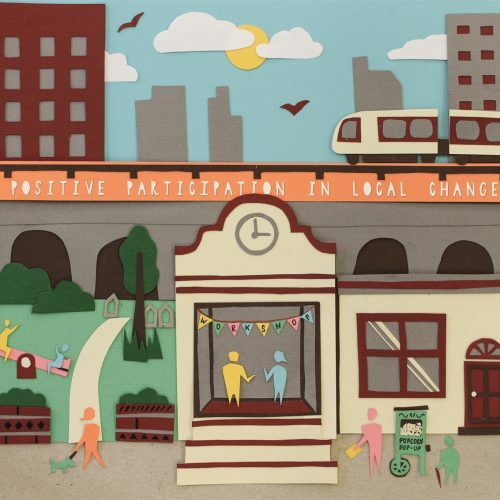 Luckily, in 2009, make:good launched to practice positive participation! At the start of this decade, in 2010, we saw the rise of the “Big Society” idea, promoted by the Conservative Party as a way to “devolve power” to communities. In reality, what this often ended up meaning was local authority budget cuts. In fact, since 2010, local authority planning departments have seen budget cuts of 46%. The Localism Act was passed in 2011, introducing “neighbourhood planning”, which in principle gives communities direct power to develop a neighbourhood plan, which sits alongside the local authority’s Local Plan to shape the development and growth of a local area. The initiative also enables communities to grant planning permission through Neighbourhood Development Orders and Community Right to Build Orders for specific developments. The preparation of neighbourhood plans are requested to be “inclusive and open”, but as the criteria only requires a minimum group of 21 people to spearhead its development, and receive 51% of approval from local residents who turn up to vote on it, there is a lot of space for people to be left out of shaping it. Although a neighbourhood plan indicates where new homes, shops and offices should be built and what infrastructure should be provided, its contents must align with the existing Local Plan drawn up by the council – so the neighbourhood group cannot decide on less development or more affordable housing than is set out in the Local Plan. It is heartening to see an official recognition of the positive role that meaningful and inclusive engagement can play in making places. The next step is to see these ideas more closely followed and adopted by all practitioners – which may require more specific guidelines set out in the NPPF. Still, we have come a long way – and we hope the future for co-design is very bright.